Need a repairer Urgent? Pest control? Plasterboa­rd fixing? painting? Water blasting? ceiling repair? Lamp repair? we are 24/7 . Thank you Brian for coming over at such short notice over the weekend! He even fixed another hole we forgot to mention and we were so grateful for that! Very affordable, great job, reliable! 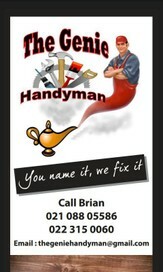 I would recomend Brian to anyone needing maintenance! Brian has been just amazing, quick communication and excellent service. Very professional and great price too compared to other companies out there. What attracted me the most is that there wasnt any call out fee and such a friendly and professional person. Highly recommended..
Brian is awesome, knows his stuff and his prices are very reasonable. Would recommend to anybody looking for a handyman. Good communication, fast service very pleasant man to deal with. Will be using him again.